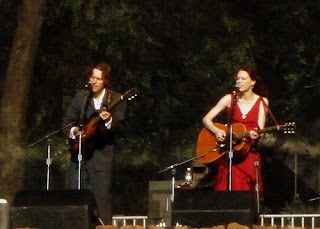 RE-POSTED JANUARY 2013 -This is Gillian Welch and David Rawlings live at the Jefferson Theater, Charlottesville, Virginia, USA, on either the 5th May 1998, or the 21st May 1998, depending on which version of this recording you have. Feel free to elaborate if you can confirm which one is right. I became an instant fan of the music of Gillian Welch upon my first hearing of the incredible 'My Morphine' and would thoroughly recommend the studio version as well the live version within this set. Dave Rawlings has been a long time 'live' partner for Gillian, and deserves equal billing, his musicianship is excellent, and without bothering to check it out, I think he has produced some of her studio output. Source: Stereo soundboard direct recording. Sound Quality: Very good MP3 @192kbps. Genre: According to Wikipedia (wait for it), bluegrass, neo traditional country, Americana, old time, folk, American Primitivism. Set: Full content from the nights first set. RE-POSTED JANUARY 2013 - This is Willie Nelson and Merle Haggard live in concert at La Zona Rosa, Austin, Texas, USA back on the 3rd December 1997. This is a reasonably well circulated concert bootleg and is highly regarded for the superb audio quality, the musicianship, and the respect that both Willie and Merle have for each other, the songs and the band. This concert just oozes quality the distinct lack of ego and the warmth and camaraderie that you pick up on between songs just adds to the overall splendour of this gig. I read elsewhere that "This is the first time ever they do “Pancho and Lefty” together live and that its fitting that Merle forgets a few lyrics, seen that he didn’t even remember recording the song when they did it years ago".